Ah, spring! When I was a child, Easter morning meant a basket of fake grass, eggs, and delicious candy, along with adorable little pipe-cleaner men playing on the sides of the basket, courtesy of an impressively creative mother. It was magic. 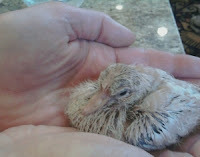 I had some magic yesterday, too, holding this dove chick in my hands, feeling its seven-day-old just-fed I'm-a-dove contentment. Nothing says spring like new, happy life.